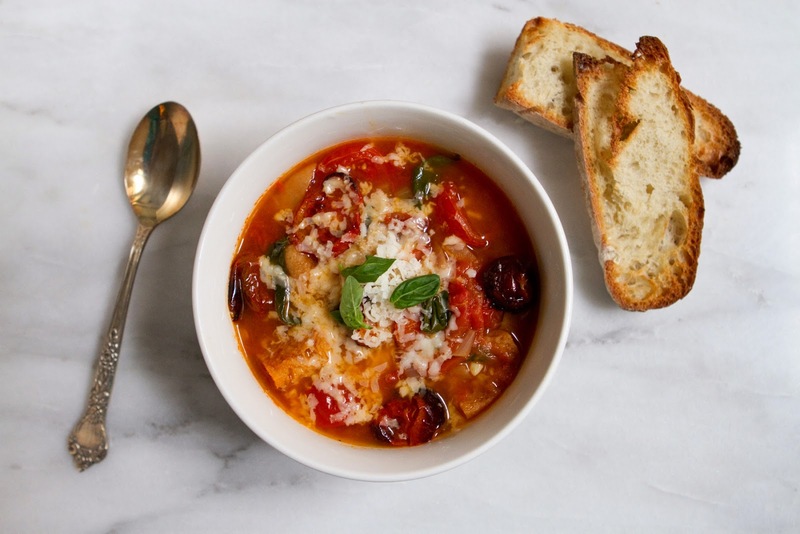 Little Market Kitchen: Pappa Al Pomodoro- Tomato & Bread Soup. 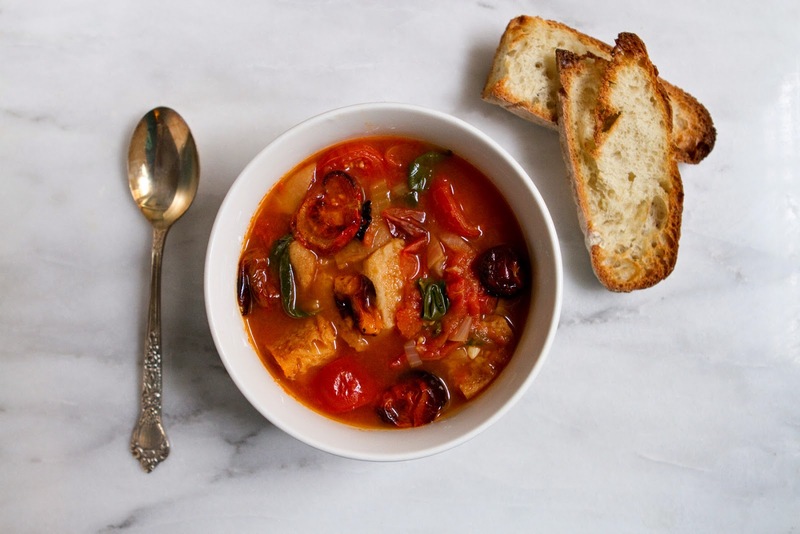 Pappa Al Pomodoro- Tomato & Bread Soup. This post is devoted to one of the most stereotypically "grown up" parts of my life, takeout lunch at work. I have three main jobs, I work freelance as a photo and food styling assistant, I shoot product and event photography, but the job I spend most of an average week doing is studio managing for a photographer (the lovely and talented Jayne Wexler). In high school, when I wasn't sure what I was going to do when I grew up, I used to read a lot of books about working in the fashion and magazine industry (in other words, everything by Lauren Weisberger, Plum Sykes, and Emma McLaughlin & Nicola Kraus), all of which would talk about lunch at work. Publishing company cafeterias, fancy restaurants like Cipriani, halal carts, takeout chopped salad, these were all things I had never experienced in suburban Ohio. My parents were teachers, their work lunches consisted of lunch boxes with contents not too dissimilar from my own. Perhaps because of my love of eating, I remember the descriptions of the Conde Nast-ish cafeteria even more clearly than I remember the infamous Blue Sweater rant from The Devil Wears Prada. When I graduated from college and got my first job in the city working for the same photographer I work for now, I experienced my first real grown up working lunches. I started out as an intern, and got to be the one to go out and pick up lunch- I thought this was pretty wonderful, in fact I felt quite a bit like Emily in The Devil Wears Prada, except my boss was cool instead of terrifying! I was picking up lunch in Manhattan and eating it at my job in a photo studio! This was frankly pretty remarkable to 22 year old me. We even ate things I'd read about in books! Sandwiches from delis and falafel pitas, delivery thai, and even delicious lunch specials from Balthazar! Many aspects of working in photography are pretty atypical when compared to an office job. I don't have a fixed schedule, sometimes I'm in the office, sometimes I'm on location. Sometimes I'll work freelance almost all week and only go in once or twice. Sometimes I retouch all day, sometimes I'm on set photo assisting, sometimes I balance the bank account, sometimes I spend part of the day picking up equipment or scouting studios. So the things that are typical and office-like stick out to me as fun and different. Takeout lunch in the studio, getting a cup of water in from the water cooler in the reception area, our new location in an office building with a doorman and an elevator that comes when you push a brass button, an elevator that I don't drive to our floor myself with a big lever. I like the blend of artsy-unstructured and office work. So, this soup then. 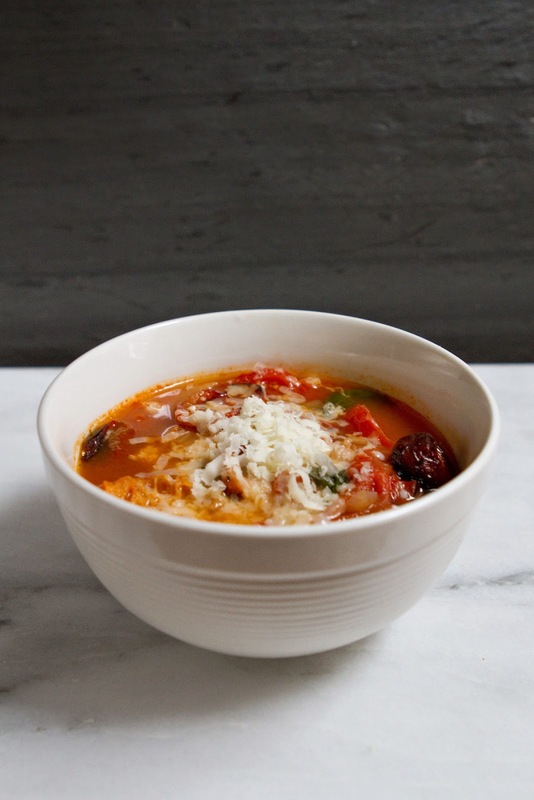 Nearby to our new studio location we have discovered an Italian takeout place that makes the most heavenly soups. Never mind that they're actually called Sandwich House because the soup is really the star here. Every day they have three different offerings, and on Wednesdays one of the choices is Pappa Al Pomodoro. 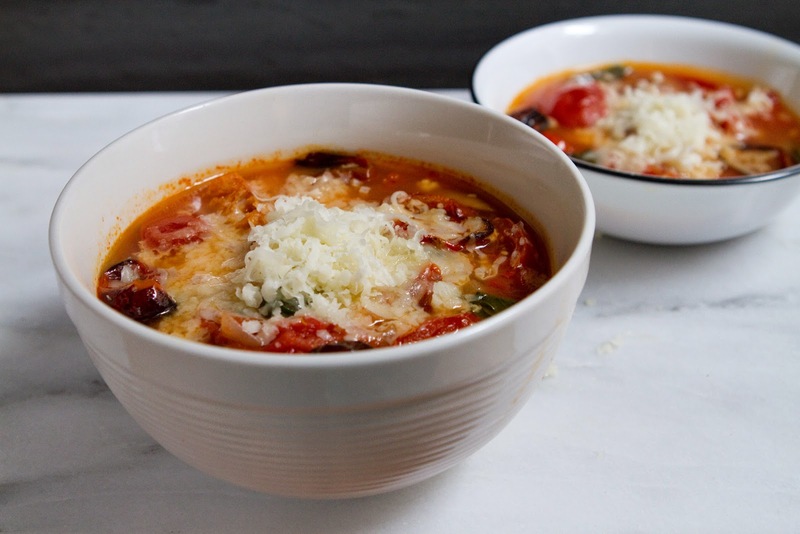 I had never heard of Pappa Al Pomodoro when I first saw it on the flimsy paper takeout menu, but I like Italian soup, and I know pomodoro means tomato, and I love tomato soup, so I decided to give it a try. I was not disappointed. I had never seen a broth-y, chunky tomato soup before, and I loved the soft, broth-filled chunks of bread. Pappa Al Pomodoro has become a bit of a wednesday tradition for me, so I decided perhaps I better try my hand at making it. I knew I wanted to add cheese, as Sandwich House does not add cheese and I've always thought this was a serious error on their part, and I decided to roast the tomatoes because I love them roasted, and S was out of the city for the day and he doesn't like roasted tomatoes. One of my biggest concerns was that I did not want this to taste like marinara sauce in any way. I absolutely despise tomato soups that taste like eating a big bowl of pasta sauce. 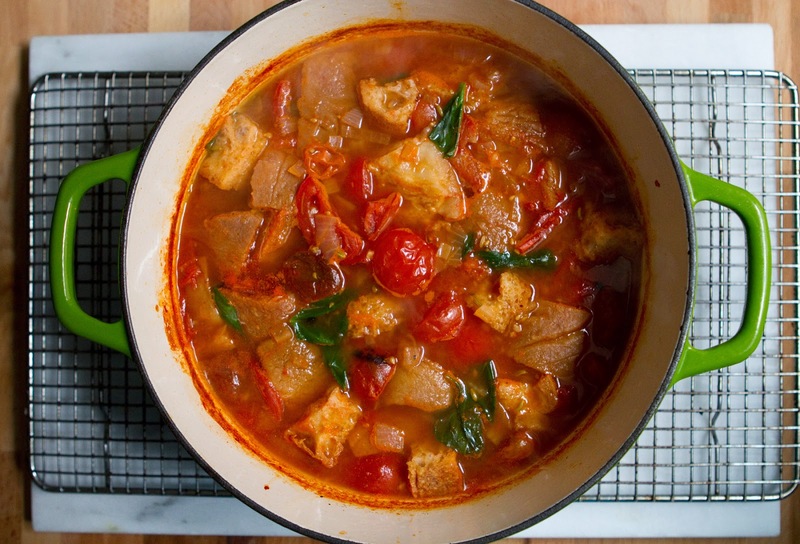 When I began researching recipes for inspiration many of them called for simply stewing the tomatoes in water, but I wasn't having that. 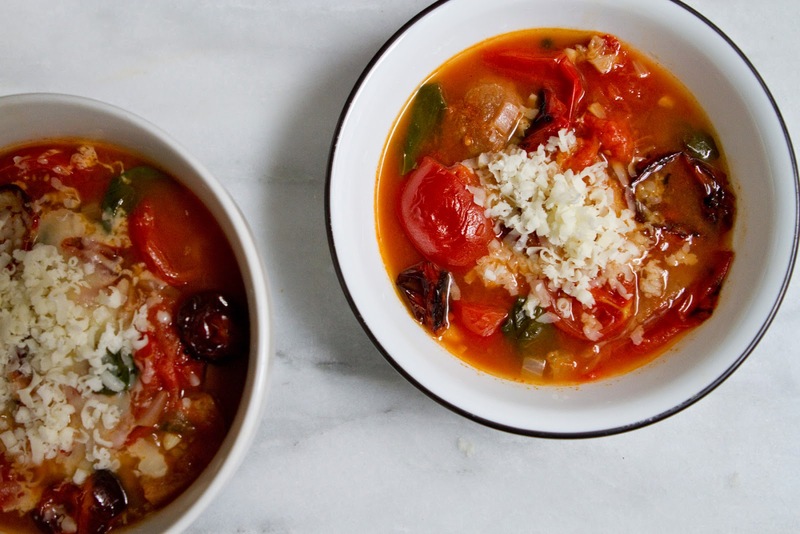 I knew I wanted to use chicken broth, to avoid going in that dreaded marinara direction. The result was lovely. 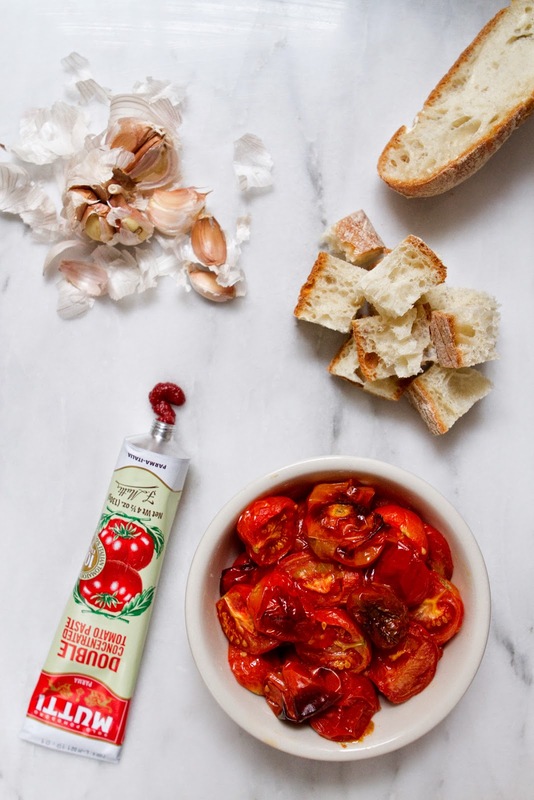 The roasted, slightly blackened tomatoes provide a wonderful blend of bright acid-y tomato and dark-earthy-caramelized burnt (in the best way) flavor. 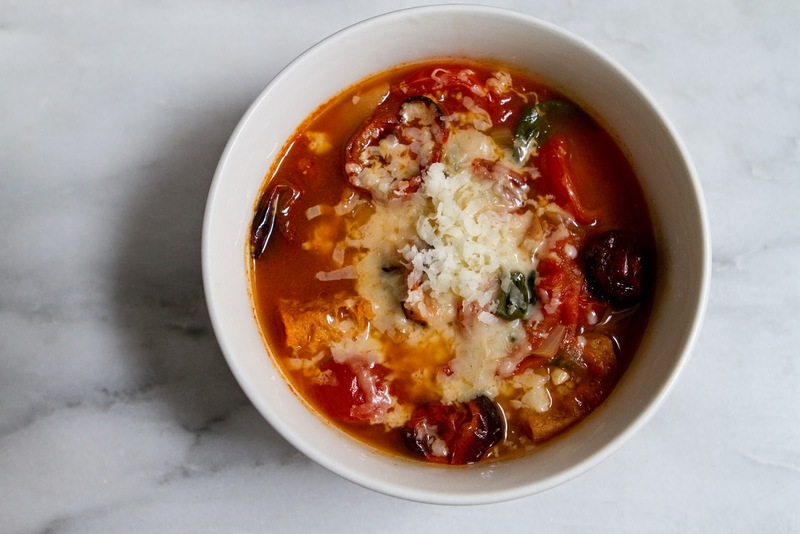 The bread becomes beautiful and soft, the zing of the basil leaves is mellowed by their slow cooking in the broth, and the cheese is of course delightful- melty and gooey and blending with everything perfectly. A step or two above my takeout Pappa Al Pomodoro for sure, though it won't make me love work lunches any less. Preheat oven to 450F. 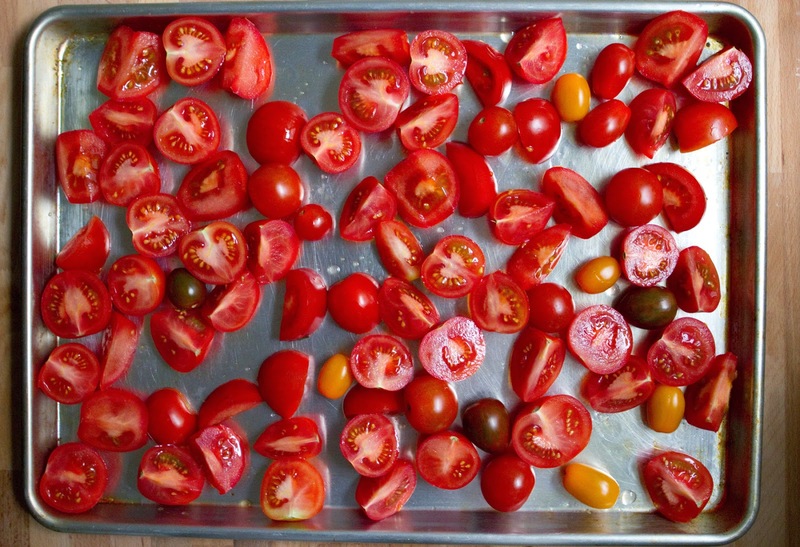 Toss tomatoes with 2 tbsp olive oil and a pinch each of salt and pepper. Roast for 30-35 Minutes, until Tomatoes are beginning to blacken. 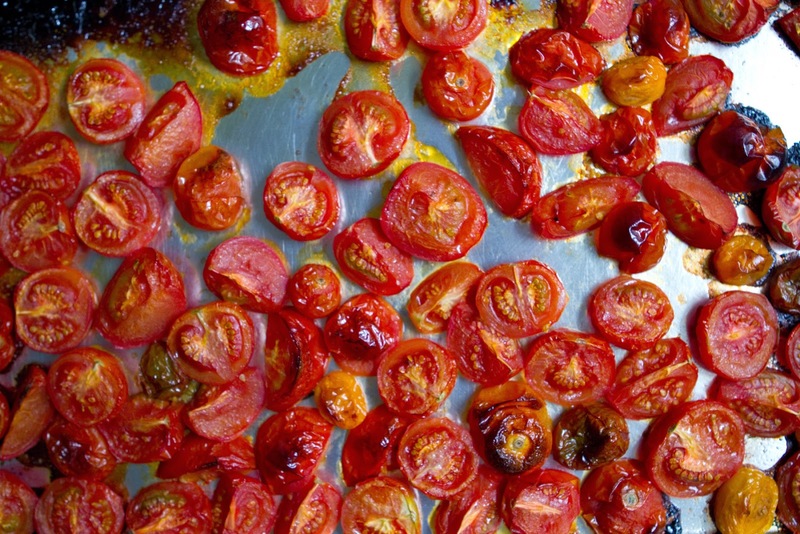 Remove pan from oven, remove tomatoes from pan and pop them on a bowl or plate and set aside. (You could do this a day or even two before and store them in the fridge to make a quick weeknight dinner). Finely chop the onion and garlic, and add to a soup pot, along with 2 tbsp olive oil, a hearty pinch of both salt and pepper, and the fennel seeds. Cook over medium-low heat until onion is translucent, about 5 minutes. Add the roasted tomatoes, chicken broth, water, tomato paste, and basil leaves, and bring to a boil. Once the soup boils, add the cubed bread and reduce to a simmer. Simmer about 20 minutes, until broth is reddish and flavorful. 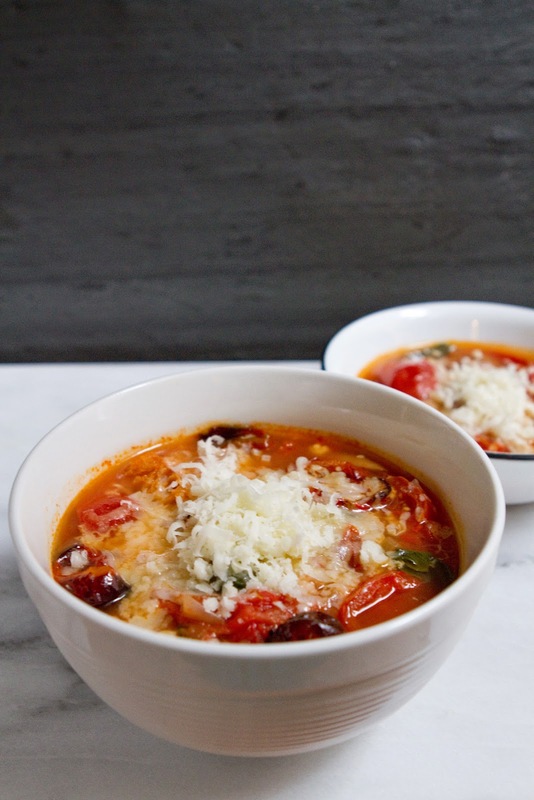 Ladle into bowls and top with grated mozzarella, and more fresh basil if desired. Hi again Denise! I was wondering if you'd want to guest post on my blog about tea. I love this blog and your recipes are darling. Please email me and get in touch either way. Thanks Leah! I will send you an email regarding guest posting soon!